I hear this question all the time from students and coworkers and I always get confused when trying to give a response. Nowadays it’s too hard to differentiate the language with just two types. 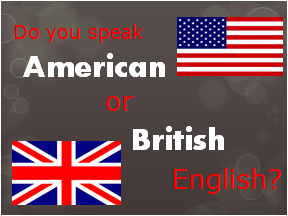 That’s why I get confused with this question because the English language has evolved so much with globalization and the spread of the English language through the media, pop culture and new technology. When asked this question I tend to say I speak universal English. Obviously I have an Australian accent but that doesn’t mean my English is much different from an American or a Brit. You might be saying: “But some of the vocabulary is different”, which is very true, but vocabulary changes from the east to the west in Australia. In my opinion, if you want to know what kind of English someone speaks, you’re better off asking them where they are from or where they learnt English. In this article we’re going to take a look at the 5 most common English speaking countries Brazilians tend to travel to: The U.S.A., England, Ireland, Australia and Canada. The accent from the U.S.A. is definitely the most prominent English accent throughout Brazil. Even American slang and idiomatic expressions have reached around the world due to their influences in the media. In American English, there is some unique pronunciation of words we can use to make our English more Americanized. The most common difference, compared to other languages, would be the pronunciation of the “T” which has more of a “D” sound. Water (wader), battery (baddery), thirty (thirdy), fourty (fourdy). British English, like all the other accents, has many different types. To make a comparison with American we’re going to have a look at a posh English accent. This style of British English can sometimes be considered more elegant (posh), and many English people believe it’s the most correct, authentic accent of all. As you will hear when listening to this style of British English being spoken, they tend to fully pronounce all the words and use less abbreviations and contractions. As I said before the “T” sound is pronounced like a “T” sound, unlike the Americans who sometimes use the “D” sound. Like the examples I gave with an American accent – water, battery, thirty etc. – the English do pronounce the “T” sound. For all our Brazilian readers, if you want to learn how to speak with an Irish accent I have some good news for you. Irish English doesn’t use that dreaded “TH” sound so many of you have problems with. This would be a one of the most noticeable differences. The Irish tend to use a simple “T” sound, or in some cases an “F” sound instead of the “TH”. Words that have the “voiced TH” sound generally use the “T” for example, Them, They, and unvoiced would use the “F” sound: Three, Mouth, etc. So if you want a good excuse to why you have problems pronouncing the “TH”, just tell people you speak Irish English. As you’ll see with the following Australian standup comedy video, Australians also have a tendency to use an intonation at the end of phrases even when we’re not asking a question. Last but not least, the Canadians. Most people confuse a Canadian and an American accent because they are very similar. Every person I ask the difference between these two accents told me the same thing, “the way they pronounce ABOUT.” Most Canadians (not all) pronounce the “OU” and “AU” sounds with something like a “U” sound, the most common, and often joked about would be the word “about.” This is also the case in many other words such as “house,” “crown” and “out.” Canadians also have a reputation for nodding their heads a lot. So, as you can see, the English language is not just a matter of British or American these days. The language is more based upon a larger array of countries of origin. Why can’t there be a Brazilian English? In my opinion when Brazilian people speak English in a natural way without trying to copy an American or a Brit, it is actually a very beautiful pronunciation, and totally comprehendible. So take this into account the next time someone asks you if you speak American or British English. See what happens when you tell them you speak Brazilian English. Accents and other subtleties in a persons speech, tell us a lot about their identity, where they’re from, their social class and sometimes personal lifestyle. So, my final advice for you on this matter is as long as you’re communicating, don’t worry too much about your accent instead, pay more attention to your cultural identity, embrace yourself in the language by getting involved with the things you like. If you have any further questions about this topic or would like to tell us about some of your personal experiences, please COMMENT below or on our Facbook Page. This article is very cool but I think that isn`t done because we have a lot os differents stuff that we know that are different. For example, when that brit people speak, when they say “over”, the pronouncing is as “ova”, while when the american people say that, they pronounce “ouver” or some seem. I am Spain speaker and I do not sure waht kind of accent I have. You can answer me about this when you want. Regards. Very interesting this topic. I think there are many kinds of Brazilian English 'cos our own accents do effects on it. Thank you. I'm practicing American English pronunciation now. My students ask me that too.I was born in Argentina and I was there until I was 14 ,then came to Spain ,where I haveI live since then.In Argentina they learn American English ,but in Spain you learn British English. Well I speak with a British accent , but when I am in Ohio ,in a few days I get American accent.